It’s been a long time since I’ve updated this blog (isn’t that always the case?) so I’m going to give you the highlights since last time I posted and then we’ll be all up to date. Sound good? 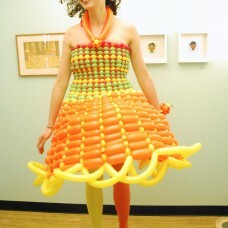 I made several balloon dresses, one that was worn for a TedX talk and filmed for a kids’ television show and another that was worn at an art show. I made an 8 ft tall barn and farm animals for Jumpstart’s Read for the Record Event. The sculptures were on stage at the Boston Public Library for the reading of the book Otis. I did a beautiful and very fancy first/third birthday party at the Four Seasons Boston. I learned how to make a balloon Hello Kitty and my daughter was very pleased. Not balloon related: I had a baby! He turned 1 and wore a balloon hat. Now I’m all up to date and hope to keep it that way! Heather and I coordinated the parties so that I could come do Ian’s Train-Themed-But-Eventually-Became-Pirate-Themed party on Saturday and then she would come do Sylvia’s Music-Themed party on Sunday. A perfect trade! Here are some fun pictures from both parties. It was a great weekend of birthday fun for everyone!